These performances are two absolute treasures featuring the magnificent playing of Michael Roll, a pupil of Fanny Waterman, and the first winner of the Leeds International Piano Competition in 1963. Commercial recordings by this superb British pianist are hard to come by. He recorded a highly recommendable cycle of the Beethoven Piano Concertos and the Beethoven Triple Concerto for Tring in 1995 with the Royal Philharmonic Orchestra conducted by Howard Shelley. These are still worth searching out. This CD is the second release from the Heritage label featuring Michal Roll. Their previous CD on HTGCD 209 includes an immaculate performance of Mozart’s Piano Concerto No. 23 in A Major, K. 488. Liszt’s B minor Sonata from 1853 is a blockbuster of a piece with an innovative one movement structure and an incredibly wide range of emotions. Running for half an hour, it requires great stamina and concentration from the pianist if it is to succeed. The sonata is episodic in nature but the episodes have to be linked together to produce a satisfying overall structure. Michael Roll has the required high level of virtuosity and wide range of tone colour at his disposal to pull it off. The technically demanding passages sound effortless but I particularly enjoyed those melancholy, withdrawn poetic passages that really capture the listener’s attention in Roll’s hands. The loud barnstorming moments are thrilling but tastefully done. This is one of the great romantic sonatas. It divides opinion. It’s best to just sit back and enjoy it for what it is - unpredictable, exciting, emotional, contemplative and exhilarating. This recording from 1978 was made for a now defunct record label. It’s unedited but quite honestly no editing would have been required. It’s a performance of stature and the sound, although slightly shallow, is very good indeed. The Beethoven sonata was recorded live at a recital given in Portland in 2008. The recital also included Schumann’s Kreisleriana, Stimmungsbilder by Strauss and the Mozart Fantasia in D minor, K. 397. Maybe they could be released in the future? Roll’s performance has all the benefits of a live occasion. The playing is spontaneous and there are numerous “edge of the seat” moments. Thankfully the piano is fairly close miked and there are no unwanted contributions from the audience other than the ecstatic and well deserved applause at the end. Even more so than in the Liszt coupling you can appreciate the pianist’s clean articulation and singing tone as displayed in the Beethoven. After a brisk, exciting opening Allegro assai the central Andante con moto takes us to the very heart of Beethoven’s contemplative genius. The final movement can sound rushed and messy if taken too quickly. Michael Roll doesn’t fall into this trap. Clean articulation at a sensibly chosen tempo reaps dividends. The music is still full of energy but you can also hear all the inner detail. The runs are immaculate and the important left hand lines always shine through the decorative right hand passage work to great effect. The fiery closing bars bring the sonata to an electrifying close. 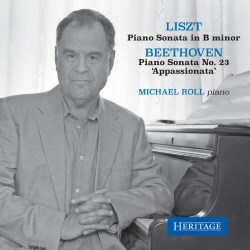 There is hardly a shortage of recordings to choose from when it comes to the Liszt and Beethoven sonatas included here. What is abundantly clear is that Michael Roll is a pianist of the front rank who has been scandalously under-represented in the CD catalogue. This is a very welcome release.